First and foremost, I want to say that you shouldn’t put off flying with a baby, or even flying with a toddler for that matter, because of those “what ifs”. Yes, baby travel and flying with children can be a daunting prospect, especially for first-timer, but it can actually turn out to be fun. And besides, flying with kids is often a means to an end, with a family holiday or reunion waiting for you when you disembark that plane. 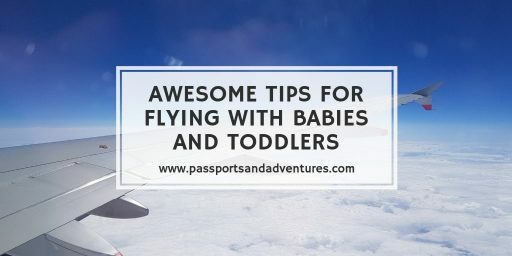 This is by no means the ultimate list of tips for flying with a baby or toddler, but these are ones I’ve either used myself to have a successful flight with a baby, or the ones my fellow travellers suggested that I thought were genius tips for flying with kids. Yes, I also asked some of my fellow travel and family bloggers what is their number one tip for flying with a baby or toddler, so watch out for them too! So, without further ado, here are my awesome tips for flying with babies and toddlers. The big thing to try and remember is to relax when you are embarking on any sort of travel with kids, especially flights. Yes, I know this may be hard to do, especially if you are fretting about it being your first time flying with a baby. But remember, babies in particular can pick up on your worries and anxieties, so if you’re not relaxed, they won’t be either. Traveling with children can feel like a daunting prospect but if you remain calm and relaxed, and treat it like any other trip, they’ll mirror you and your flight will have a chance to be a great one. 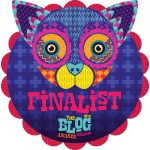 My good blogging friend Lisa from the Flip Flop Globetrotters couldn’t agree more with this ethos. If parents are relaxed, kids generally will be too. Check out Lisa’s other great tips for flying with infants and toddlers over on her blog. Take time before you get to the airport to plan your bag and carry-on luggage. Why? You really don’t want to be struggling to remember which bag you packed the spare nappies in when you’re in the boarding queue or on the plane. Packing cubes or even clear makeup bags can lend a huge hand in organising your hand luggage. I used clear make-up or cosmetic bags to organise our hand luggage for our trip to Portland so that if I pulled out the wrong one, it was easy to see and quickly. This post from Yorkshire Tots will help you plan your carry-on luggage, particularly for long flights with toddlers. Backpacks are so much easier than a traditional change bag when flying with young children. Not only can you generally pack them with more things, but they also leave your hands free to deal with little ones in queues. Backpacks are also far easier if you are flying solo with babies or toddlers. I travelled with a traditional change bag until I discovered the ease of backpacks and I’ve never looked back. Now, we never travel without our Cabin Zero cabin bags, which I reviewed on the blog. Using my CabinZero backpack leaves me free to pull my son on his JetKids BedBox. If you can afford it and it’s an added extra, pay to choose your seats and pick them as soon as the option becomes available online, so you can ensure you are sitting together. I know many families will disagree and say this is adding more cost onto your flights, but do you really want to leave it to chance that the desk or online check-in will automatically put you sitting together just because you are a family. Not all airlines give families priority when it comes to seats, even for under 5’s. We always pay for choosing our seats to avoid this unnecessary stress. Generally, most airlines will allow families to board first, but increasingly we’ve found this not to be the case. For this reason, and more so as Alex gets older, we pay for speedy or priority boarding, especially on low-cost airlines like EasyJet and Ryanair. This ensures we can place the bags we don’t need during the flight into the overhead lockers, and so that Alex is seated and out of everyone’s way. Some people say board last but then you face the stress of not having anywhere to store the bags you don’t need during the flight. Sorry, but that’s another stressful situation I avoid. By boarding first, our bags are stored, Alex is seated and we can start to relax about the flight ahead. If you really don’t want to board first with your children, send the other adult in your party, provided you aren’t solo travelling, on first to stow your bags and then board last with your children. This might be a better option with toddlers who are now walking and might not be ready to sit still in a seat any longer than is necessary. Arrive early at the airport so that you can take your time and are not in a rush. Arriving early will also allow you to queue for check-in first and this might in turn mean you can get a bulkhead seat with bassinet for your baby (if you haven’t already pre-booked it). This is particularly important if flying long-haul with babies. Following on from the previous point, getting rid of your hold bags early will free you up to keep an eye on little ones, and to get you through security and into the departures lounge quicker. If checking-in online before you arrive at the airport, ensure you have your boarding cards printed, or downloaded to the airlines app on your phone (make sure your battery is full for this option, and have a portable charger for your phone in you carry-on luggage). However, if travelling with a stroller or buggy, you will need to visit a desk to ensure you get the tag for your buggy if bringing it through to the gate. Have your bags ready, coats off, pockets empty, tablets/iPads out and liquids ready for inspection. There is nothing more infuriating in those queues than someone who doesn’t get ready before getting to the belt, especially when there are children involved. We’ve queued long enough to get to the desks in some airports, only to have someone in front of us spend 5 minutes sorting themselves out with a bored toddler on our hands. Get your stuff ready BEFORE you get to the desk. 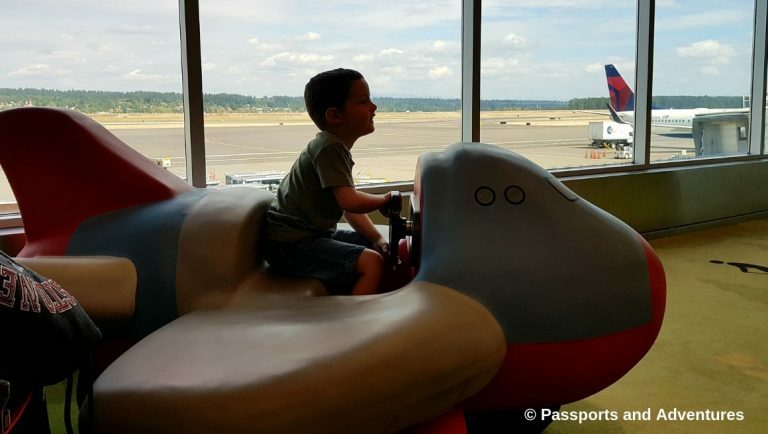 Before the flight, take a visit to the airport playroom (if there is one available), to help energetic toddlers burn off excess energy before the flight. I must admit that I had not heard of, or even knew, there was such a thing as playrooms in airports until before our two-week USA road trip. I learned of them on a Facebook group and thought this was a genius idea. We used the one in Heathrow before our flight, and also found one in Portland before our return flight. Not only does it help kids burn off some energy, but it will give you a few minutes peace. They are also worth their weight in gold if your flight is delayed as your baby or toddler won’t know any different. International Airport before a trans-Atlantic flight. Consider whether you really need your buggy or stroller with you, all the way to the departure gate. If not, then I’d advise you to check it through with your hold luggage and use a baby carrier instead. It is one less item to have to worry about in the departures lounge. We stopped taking Alex’s buggy to the gate once he hit three years of age, but you might decide you need it. It’s always handy if they are still napping during the day or you have an evening flight. 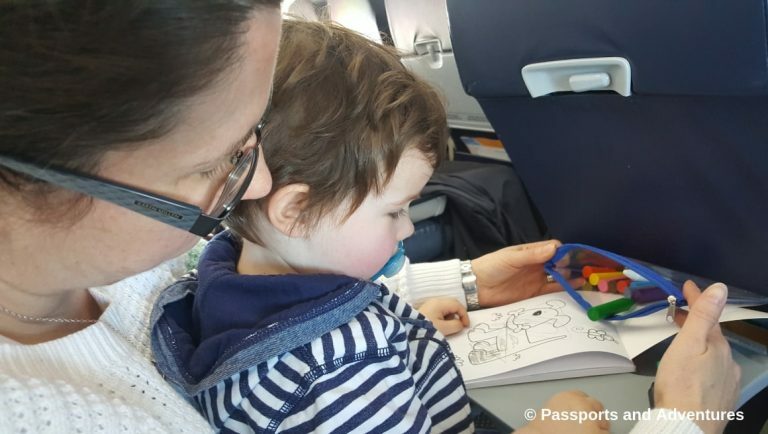 For more pre-flight tips, check out the brilliant post by Carrie of Flying With A Baby in which she guides you through tips from booking to your arrival. She has many more tips you should consider before even booking your flight, including what are the best airplane seats for kids, she can tell you what age can a baby fly and rules and tips for flying with a newborn baby. You never know when you might need one or all of these, and if you don’t, you might find another parent on the plane who is grateful you had it with you. A travel first aid kit might also be a useful thing to add to your cabin luggage. Carry antibacterial wipes as well as your usual wet wipes as planes, trains and baby changing rooms harbour so many germs, and there is nothing worse than a sick baby while travelling. remember Calpol and Bonjela in your hand luggage. Snacks, snacks and more snacks. Snacks can be a lifesaver when flying with babies and toddlers. They are especially handy in between meals for toddlers who like to graze. Dare I say it they also relieve some boredom in toddlers, who let’s face it, have attention spans of goldfish. I fly quite a lot with my eldest – best tip; snacks! As well as plenty of snacks for the kids, make sure you take enough for yourself too! It’s not so easy to grab yourself some food whilst chasing a runaway through the terminal, or even if you have an in-flight meal, it might not be practical. Parents and children do not need to be stressed and ‘hangry’ whilst travelling. Snacks can also come in handy if you find yourself delayed for any reason. Yes, there are usually food outlets in departures lounges, but if you’ve just had lunch or dinner they can placate a bored toddler especially. And don’t forget to keep everyone hydrated during the flight. Firstly, for those of you wondering about flying with baby formula, or taking baby food on a plane, the answer is you can! You can take pre-made bottles but be aware you may be asked to taste the contents at the security desks, although I’ve read elsewhere that this has been replaced by other non-invasive additional tests in certain airports. You can also take the ready-made cartons of baby formula on a plane. However, we chose to do something different. We packed pre-measured baby formula powder into the easy-add containers, enough for all the feeds needed at the airport and on board, as well as two more. We took empty pre-sterilised bottles with us in Ziploc bags (although there are also disposable pre-sterilised ones available on the market). Once on board, we asked a flight attendant for 1oz of boiling water, added the formula and topped up using natural, bottled water we had purchased once we were through security and in the departures lounge. This worked a treat each time we flew while our son was still bottle feeding. Alternatively, you can bring an empty thermos flask with you and ask a cafe or hot drinks outlet in the departures lounge to fill it with boiling water for you. Make sure you bring enough formula and bottles for all the feeds needed at both the airport and during the flight, as well as at least two additional feeds, just in case of delays. Most of us don’t go anywhere with babies or toddlers without at least one change of clothes for our little ones. But when it comes to flying with babies and toddlers, here’s the thing. Bring more than one set, particularly if you are flying long-haul. You just never know what might happen and you don’t want to get caught out 35,000 miles up in the air. I always travel with 3 sets of spare underpants (now that our son is toilet trained), at least one set of shorts and trousers, two t-shirts or tops and also a pair of pyjamas, especially for red-eye flights. And that’s just for Alex alone. I also travel with a spare t-shirt or top for both myself and my husband, just in case our son should ever get sick. Touch wood, that is yet to happen but never say never! No-one wants to face hours on a plane in wet, sick-encrusted t-shirts! We always take spare clothes for baby and us. You never know when you will need it. Especially if baby is prone to being sick after feeds like our two. What did we ever do without wet wipes? How did people cope before them? Not only do you need them for all manner of wipes and clean-ups with kids, but you can use them to clean the tray table too. When our was in nappies I also packed at least 3 extra nappies, in case of delays. And don’t forget, you can get reusable wipes these days including ones from Cheeky Wipes. Get 15% off any order with Cheeky Wipes over 40GBP by clicking this link! Not only will you need these for nappy changes, but they also come in very handy for rubbish/garbage. These can hang from the tray table catch on the back of the seat in front of you and you can place all your accumulated rubbish in there. Then it’s easy enough to hand over to the cabin crew when they make their pass through the cabin. Try to remember to bring a few quiet, interactive toys, to keep babies and toddlers entertained during the flight. Try to leave the noisy ones at home so as to not annoy your fellow passengers. 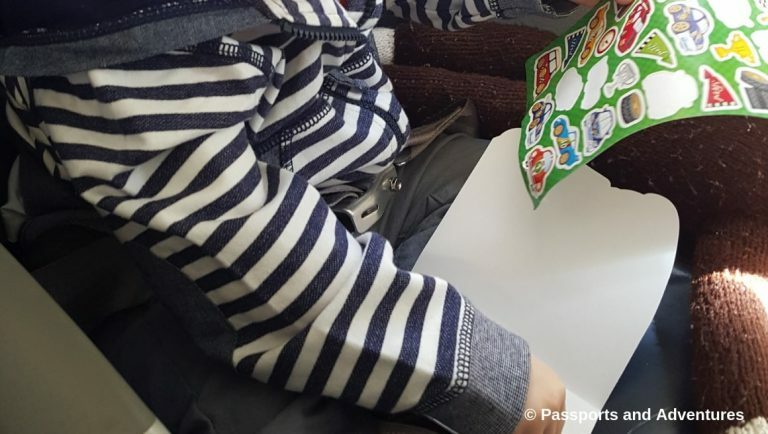 Sticker books, colouring books and crayons are always a hit with our son, especially when he was younger and didn’t really want to sit in our laps ready for landing. Small building blocks, animals and cars for great travel toys for toddlers on airplanes. Don’t forget to pack some toys – crayons and colouring books work wonders. Stickers and a sticker book to the rescue. Does your family have an iPad or Tablet? If so, let your toddler use it, especially if you have exhausted all the toys and toddler plane activities from the point above. We don’t let our son use electronic devices at home, but he has not one, but two tablets for flying. He has a LeapFrog Epic with games and some TV shows on it. He also has another android tablet on which we’ve put numerous films for him to watch. 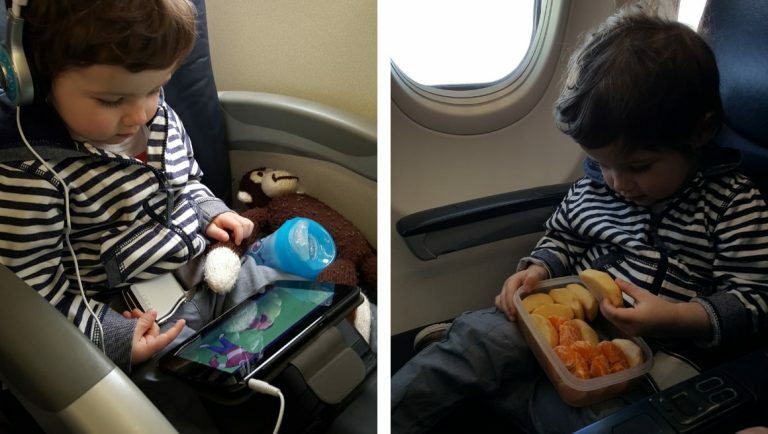 Relaxing on a trans-Atlantic flight with his tablet. Make sure you pack at least two portable chargers for your phones and iPads/tablets. This is even more important for long-haul flights. No-one wants to run out of battery half-way across the Atlantic and have an irate toddler on their hands. We have been lucky with some airlines having USB charging ports at each seat, but this has only happened twice on America-bound flights. For shorter European flights the chargers have come in handy, especially if we’ve been delayed leaving and have resorted to giving Alex his tablets before boarding. But don’t lose it! 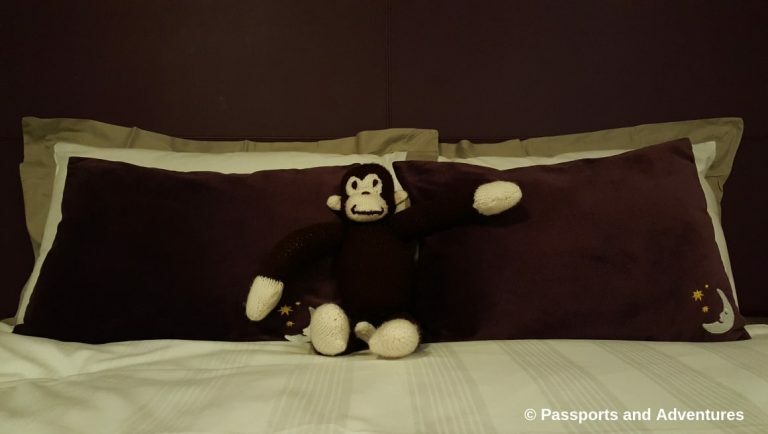 Alex was sent a fabulous knitted Curious George by his Nan when he was just 18 months old and until late last year, George travelled everywhere with us. He has been to the Canaries several times, Slovenia and even New York. He was a home comfort that Alex knew and loved, and was also something he fell asleep with every night. So, consider bringing one of their familiar cuddly toys, but whatever you do, guard it with your life. Or ensure you have a second one at home like we did, just in case. George on holiday after his flight. When boarding the plane, there will no doubt be glares sent your way for daring to travel on someone else’s flight with a baby or toddler. IGNORE THEM. We all have to start travelling at some stage or have holidays as a family, and that involves flying with babies and toddlers as well. That said, do not let your kids kick the seat in front of you or scream their heads off for no reason for the entire flight. Not only will you get glares and tuts, but it will stress you out! While our son has always travelled well, we do our utmost to ensure he isn’t kicking the seat in front of us, and remains relatively quiet too. Following on from my point about preparing your cabin bags before you get to the airport, keep all essentials in one bag and place it under the seat in front of you. Pack 2 bags if necessary and stow the other one away in the overhead compartments. And ladies, don’t bother with a handbag, it’s too much faff! We also have a Trunki insert bag which holds all of Alex’s sticker books, crayons, colouring books, small toys and tablets and this usually hangs quite nicely from the pocket on the back of the seat. That way we have everything we need to keep him entertained to hand. Our son’s Trunki insert bag on the seat pocket in front with everything he needs for a flight. I have experienced troublesome ears after a flight and I can tell you it is very unpleasant. That is until I learned how to pop my ears, particularly when we are coming into land. However, babies and toddlers cannot do this, so we need to give them a helping hand to ensure the air in their ears is equalised. If you are wondering how to prevent babies ears from popping on plane, let me help you. Feeding during take-off and landing, or giving a baby or toddler a dummy during this time, can really help to ensure their ear pressure is equalised and that they don’t suffer with pain in their ears. Thankfully our son has never had a problem with his ears and flying, but that is because we have heeded this advice. Alana from Baby Holiday said her top tip is a bottle for take-off. It’ll help prevent their ears from popping, and if you’re lucky will send them to sleep! For children who might be undergoing toilet training or are newly potty trained, it might be advisable to use pull-ups, particularly for long-haul flights. 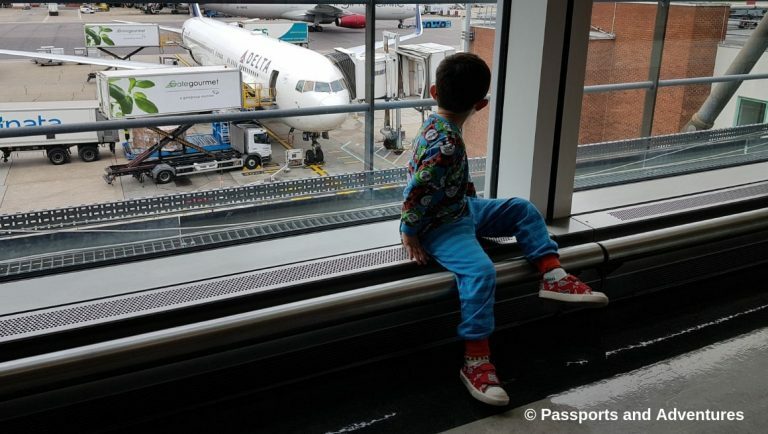 We nearly had a heart attack on our flight from Heathrow to Portland in August 2017, when shortly after take-off and before the seat belt sign was turned off, we heard those dreaded words “Mummy I need a wee”. At three and a half, our son was quite good at holding it, but as the minutes ticked by his desperation became more and more apparent. We hadn’t put him in a pull-up. After 20 minutes we rang the call bell and the flight attendant told us we could bring him to the toilet (despite the seat belt sign still being on), “You gotta do what you gotta do for your boy”. She was so lovely about it. Disaster was averted. But I regretted not bring pull-ups with us. Also, it might be advisable to put a changing mat or towel under newly toilet trained toddlers on the seat, just in case. At least if they have an accident, the seat will be saved. Even if our son said “I don’t need to go” when we asked him, we took him regularly to the toilet after he was trained. And he ALWAYS ended up going! Make a game of it if necessary. And always anticipate when the seat belt sign will come on in preparation for landing and take toilet trained toddlers to the toilet just before this. Again, it comes back to my previous point in that you don’t want to forget and hear “I need a wee” during those final few moments before you touch down. We generally wear loose jogging pants for long haul flights and always change our son into pj’s for these flights. It makes us more comfortable having to deal with sitting in one seat for a long period of time. It also makes sleeping on the plane a little bit easier. He has been known to strut his stuff in his pyjamas through Heathrow! Comfortable in his pyjamas after another trans-Atlantic flight. This might seem crazy, but ensure you have a cardigan/jumper/hoodie with you for the flight, even if you are flying from a hot country to a hot country. Planes get cold, and babies and toddler will feel it even more than us adults. It’s easier to remove a layer or two of clothing than it is to get a baby or toddler warm when you’ve nothing in reserve. And when flying with an infant, baby or toddler, I’d advise bringing a small blanket with you to cover them up if they fall asleep. It’s worked wonders for us in the days when our son would still sleep on a plane. 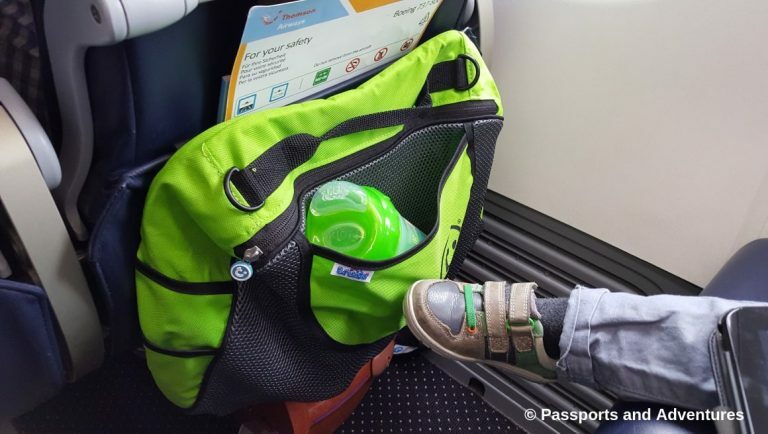 For the very few times we would be flying in the evening or at night, we always brought our son’s travel Grobag to keep things in line with our usual bedtime routine before he outgrew them. Our son sound asleep with a blanket to keep warm coming home from Lanzarote. This is even more important if you are flying solo with a baby or toddler. If you need it, ask for help. From the crew, or fellow passengers. Don’t assume they will realise you are struggling or are in need of some help. No-one in their right mind would dare refuse a mum or dad some help on a plane if they needed it. 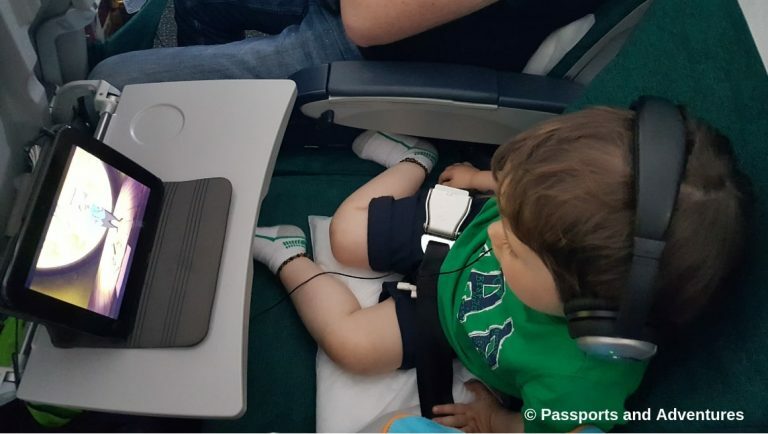 One of my first ever solo flights with our son came when he was ten months old, and the Aer Lingus staff on both my outbound and return flights couldn’t have been more helpful. They held Alex so I could stow my bags and get them at the end of the flight, and they also checked on me during the flight despite it only being a 55 minutes flying time. If I could fly with them all the time I would. Mr Passports used to always sit at the window, always. But not anymore. For a few years now, he has had to relinquish the window seat for our toddler, and now pre-schooler. No matter how much bribing he tries, our son always gets the window seat. He might look out it a few times during the flight, but it’s his and his alone these days. “I’m looking out the window”, as a toddler and as a five-year-old. 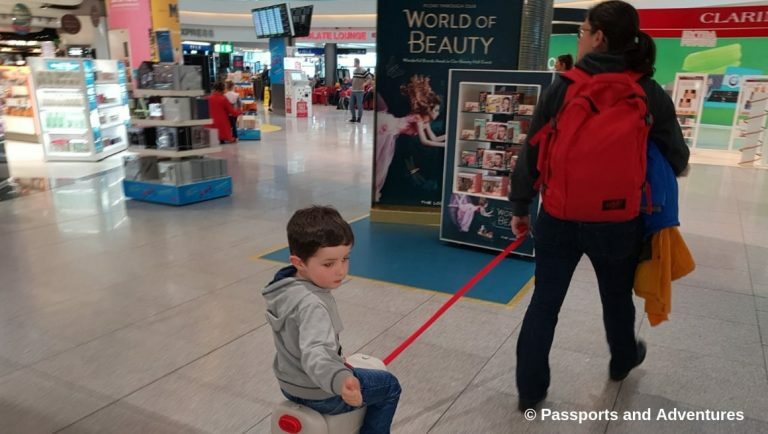 This can be a hot topic with some parents but believe me, until recently, we never travelled without toddler reins for Alex once he became a walking toddler. We now travel with the Adventure Belt, the next step up for preschoolers, which I reviewed on the blog. They might not necessarily be needed if you are taking your stroller to the doors of the plane before take-off, but you aren’t always guaranteed to get your stroller the minute you land. So, to prevent toddlers from running off in the airport, it’s worth considering packing a set of reins or an Adventure Belt to save your sanity after a long flight. If travelling from the UK, did you know that you can order things like nappies, wet wipes, formula, creams and lotions to be delivered at a Boots in the departure lounge of the airport you are travelling from? This is a brilliant way to save on luggage space for things like nappies and formula and can ensure you remember everything you need for your family holiday. I’ve personally never used the service, but I know people who have and would recommend it. For long-haul flights I would try to fly at times your babies and toddlers would normally sleep, particularly if leaving in the evening and arriving in the morning. You cannot guarantee they will sleep but if it coincides with a time they will be naturally sleepy, you’ve a good chance of them nodding off. For short-haul flights, either choose a morning flight or try to get one when they usually nap. Before Alex was one years old he slept on planes whenever the flight coincided with his nap time. However, over the age of one it became trickier. And a short-haul flight at night with our son didn’t work. He didn’t fall asleep as there was too much going on in the plane and the lights were kept on. So, try to think about your flight times before you press that BOOK button. While yes, this will cost you more than long-stay parking, bus transfers are a pain in the bum with bags, a baby, stroller and hand luggage, especially if you are flying solo with a baby or toddler. So, if you can stretch to just a little extra, book your parking at the airport as close to the terminal as you can. It will also mean you’ve less distance to walk and might negate the need for bus on your return, meaning you can get home quicker. It goes without saying that if you are going to be flying with babies and toddlers, you really MUST have travel insurance. Most times you won’t need it but that one time you forget it will turn out to be the time you do need it. We went on holiday to Lanzarote one year and were grounded for an extra three days because our son came out in chicken pox. Thankfully our travel insurance covered most of our extra expenses. The following year, at the same hotel, Alex fell on our arrival day and cut his knee so badly he needed 4 stitches. A trip to the nearby hospital was needed and they asked for his EHIC card. I had brought it and his passport, as well as ours, so we were all sorted once we arrived. So, do not travel within Europe without it. This tip comes from Anna at Popitha. Her tip is genius! 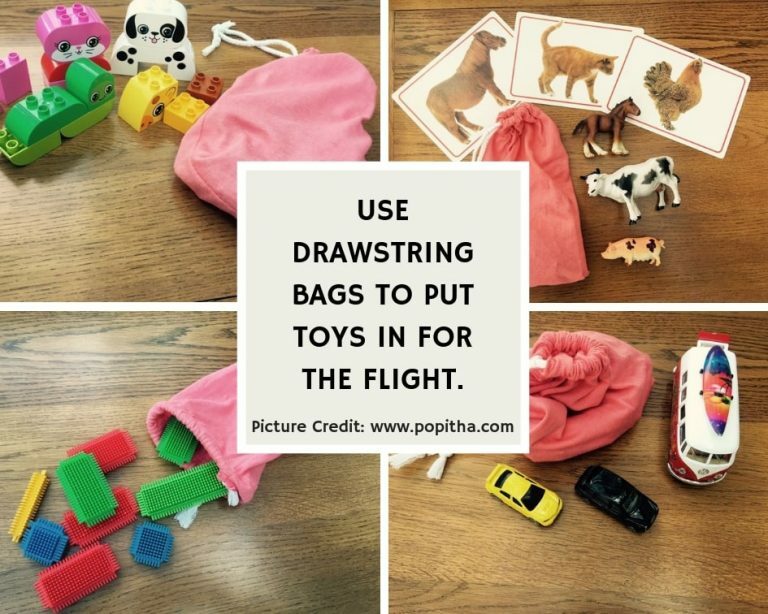 Use drawstring bags to put toys in for the flight so you can easily get one bag out at a time, and then pack it away so all the bits are still together. I haven’t used this before, but you can be guaranteed I will be from now on! Genius idea from Anna to use draw-string bags for toys for the plane. My top tip (if you are travelling with another adult) is to plan in advance fair ‘shifts’ to take care of the kids and relax/watch movies/sleep. There’s nothing worse than arriving at a place with one parent who’s had 8 hours sleep and managed to watch a movie, while the other seethes with resentment because they walked the plane behind their toddler the entire flight. If your little one is going on their first of many flights, why not invest in a Simply For Flying Flight Logbook. This is the flight logbook I mentioned at the start of this post. Apart from one or two return trips (where mummy forgot to pack it), we have logged every flight Alex has done and he’s gotten some lovely messages from the captains. It’s a lovely memento to have for them. As already mentioned, this is by no means the only list of tips for flying with babies and toddlers. It may even be added to it as other hints and tips for flying with a toddler or baby springs to mind. 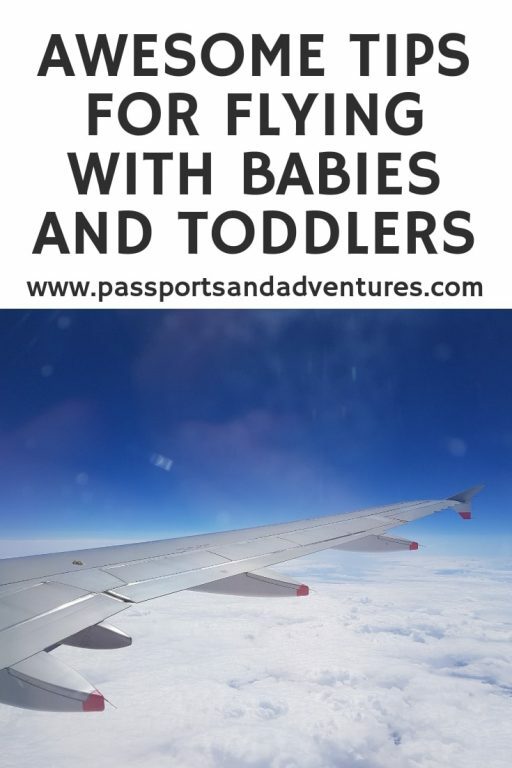 There are numerous other posts about flying with a baby and toddler available to read and they are all packed with handy tips. It’s natural to feel nervous or anxious if you are taking a baby on a plane for the first time, but remember the #1 rule, relax. 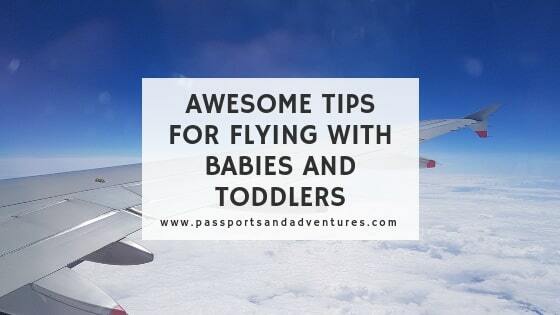 Are there any hints and tips for flying with babies and toddlers you can add to this list? Did I miss anything out? This is an amazing guide. I love the Logbook idea and might get one for Ivor now whilst he’s a baby. When we went to Edinburgh we took a bag of sweets and handed them out to the other passengers sitting near us as a preemptive “sorry our baby might cry”. It seemed to be appreciated! Thanks Laura. I’ve heard the gifts can go down well. 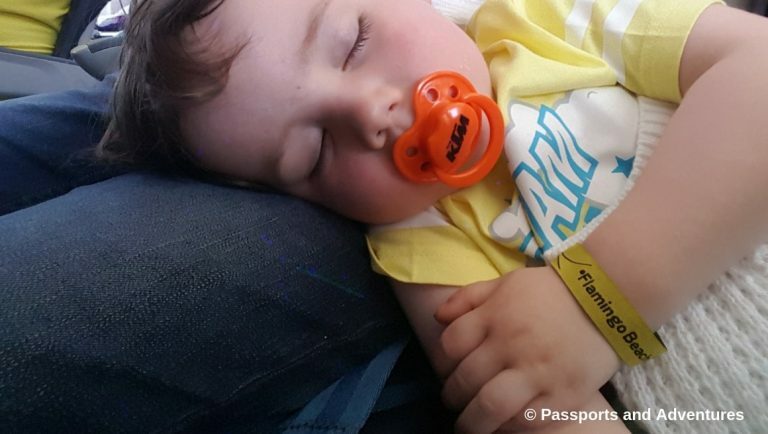 This is a really useful and detailed guide hon I know how much experience you have had and so it’s brilliant you are sharing all your tips here for the benefit of other parents who might be travelling with babies and /or toddlers. Some fantastic advice here. Have to 100% agree with making sure you’ve got your seats assigned before you turn up .The last thing you want is to be split up as a family! Absolutely, I’ve read some horror stories and definitely don’t want to face them myself! Some great tips there and i have bookmarked this as we are hopefully having our first holiday this year with the kids! although i don’t have kids, i do have 3 much younger brothers and holidays with them – especially plane journeys, are always really stressful for my mum and so that impacts me ! But these are some great ideas, ill be sending them to her! This is fantastic advice. Once when we flew from Manchester we had three children (4,4,7) running rings round us, when we eventually walked to our gate, we discovered there was a play room right near it! No one had mentioned it, they now wanted to play in it, and it was time to board!! Oh no. Why don’t people share this information. And why don’t airports have big signs telling you if they have one as they’re great for kids! I’ve never counted out air miles, but my kids have done a fair bit of flying in their time. I have to admit though, we’ve never paid extra to choose seats. Great tips. We are flying with the girls in June for the first time since Little I was a baby! Haha, I know how you feel. I’m still in charge of everything despite having a husband AND a child! There are so many tips in this post. It’s so useful for those with young children. Your son looks so comfy on the plane. I also find backpacks super comfy when travelling. I think they’re so much easier, especially when you need two hands with toddlers! I am so lucky with mine that they all love flying, especially Sebby – they all insist on sitting by the window though and end up doing activities…….I want to see the world go by outside! That’s my husband, he used to love watching the world go by, now he has no chance! I love all of these tips! My toddler has been on 12 planes in one year, so she’s very flight experienced. But there are a few things here we don’t do. I didn’t know there were playrooms in airports! I’ll definitely look for those next time and I also really love the drawstring bag idea! I’m definitely noting down lots of tips to carry through with us on our next flight. Yes I only discovered the play room thing last year, although not airports have them. And I thought the drawstring bag was genius. Definitely doing that for BattleKid! Such a great and detailed post. 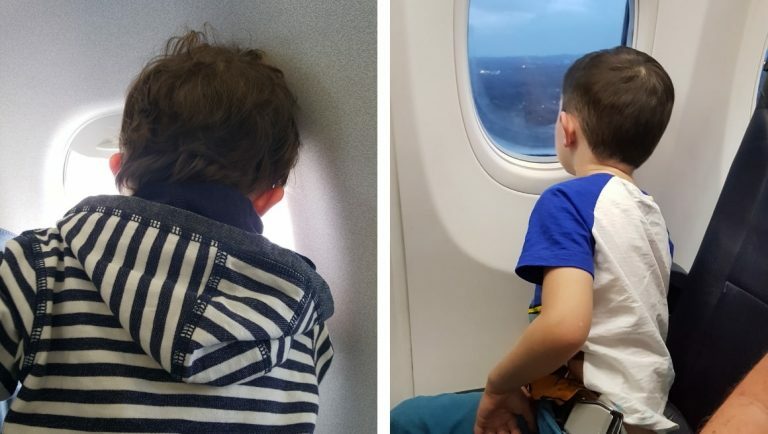 I was so nervous about traveling on planes with my sons, but it was actually okay. The tablet kept them entertained with their favourite cartoons and we pre-book our seats so we avoid stress. Tablets are a godsend for flights and we also pre-book our seats. Couldn’t be doing with that stress! This is great advice. How does it work with seats for young babies who are under 1? Do you have to bring your own seating or will the airline supply one? Babies under 2 sit on a parent’s lap unless you book them a seat. If they are sitting on your lap, you get a baby belt to put through yours and then around their waist. If you book them a seat (and be aware there are no discounts for seats for under 2’s), then you can use either use an airline-approved car seat for very small babies, or use the seat for them during the flight (more for between the ages of 1 and 2). But they still need to sit on your lap for take-off and landing if not in a car seat. However, I would advise reading Carrie of Flying With A Baby’s blog for better information on this issue (her blog is linked within the post). Brilliant tips. We’ve taken over 40 flight already and my son has only just turned 3 so we are well-travelled too. Thank you. I think it’s brilliant to get them travelling from a young age. I’d love to know how many miles your son has one already. Must be quite a bit! Brilliant post with so many useful tips. My kids really suffered with painful ears on their first flight and I struggled to get them to pop them! Great post! Thank you for including us. Im so glad my boys are no longer on formula. They were on special formula that tasted disgusting. Me and my husband would try beat each other with packing at the other side so the other person would be left to taste it. Ha! Haha, I don’t blame you! I think my husband and I would have been the same in your position. And thanks so much for helping out with your top tip for flying with babies and toddlers too! Great tips. I’m with you on #5. I remember growing up we used to be able to board first, families with kids and elderly. Nowadays though, it’s not as common. I don’t understand why. Such a great comprehensive list, I wish I had this before I traveled with ours when they were toddlers, would have saved me a lot of stress! You are so right in saying that it’s best to ignore the glares from other passengers, we try our best as parents but we don’t always get it right. Very true Liberty. I do give sympathetic smiles to fellow parents when we fly if only to show a bit of knowing support. Thank you for this really great guide. It helps me prepare and hopefully not let me stress out too much. I also just want to add – consider taking a cruise! You still get to go somewhere awesome, and cruise ships are super exciting and fun for children. Plus you can take more stuff. The only place my eldest went as a baby on the plane was to Manchester several times which is less then 1 hour. The first time my youngest was on a plane was aged 6! We always stayed in the UK while they were both young. The thought of travelling with babies or toddlers would cause me too much stress. I know people who do though and that’s great! I have not even done 60,000 nautical miles and i’m nearly 40 lol!